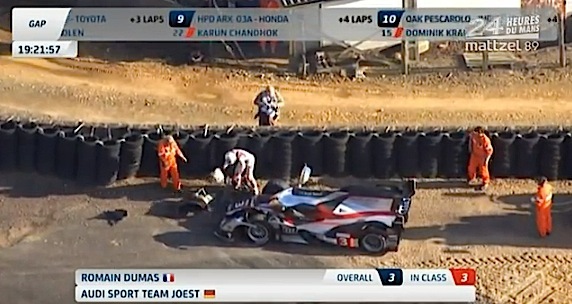 Romain Dumas crashes his Audi R18 Ultra into a tire wall, then proceeds to get out of the car and basically remove the entire front bodywork from both sides, get back in the car and drive it for 5-6 minutes back to the pits! Amazing bit of effort and determination from Dumas! Great to see. As of right now, the #3 R18 is back in the race! Many laps down….but still in the race! Great to see a REAL racing driver who refuses to give up!